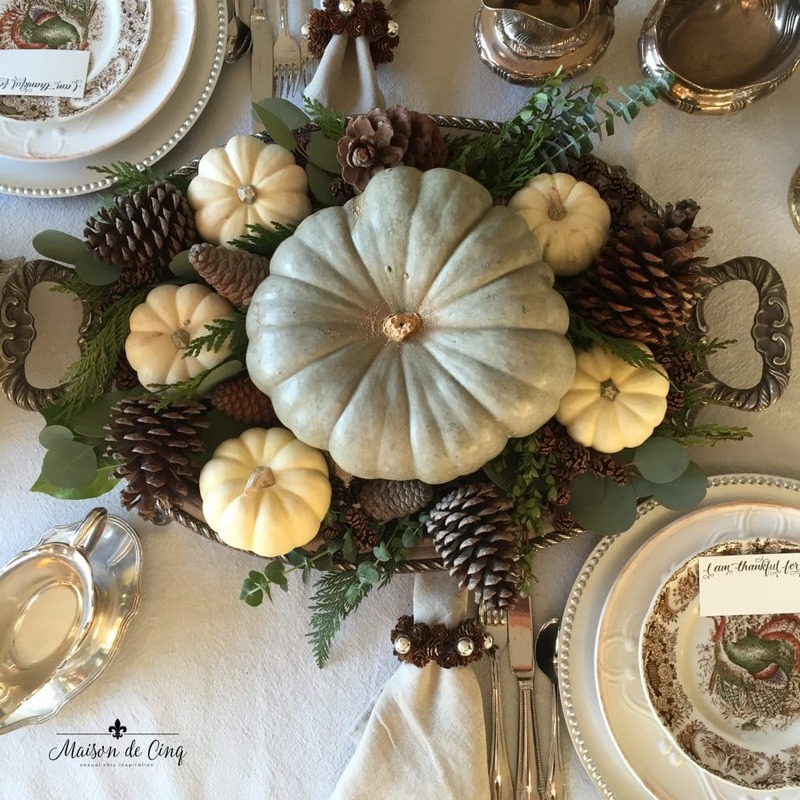 I wanted to do something different for my Thanksgiving table this year, so I’ve been playing around with tablescapes this week to see what I could come up with. Tables are something I really enjoy creating, and I know a lot of you do, too! 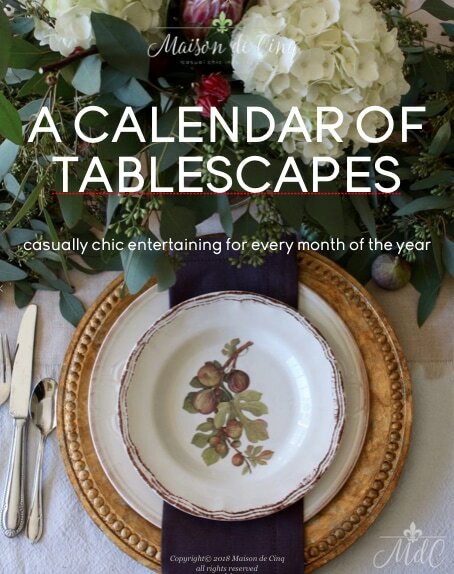 If you’re looking for more tablesetting inspiration, be sure to check out my free e-book featuring twelve of my favorites! I really loved the neutral one I did a few weeks ago (you can see that table here), but I wanted to use my turkey plates for this one, so I needed to do something with a little more color. The plates have browns, cream, and greens so I concentrated on the browns and greens and went from there. This table is earthy and a little rustic, but still traditional, I think. 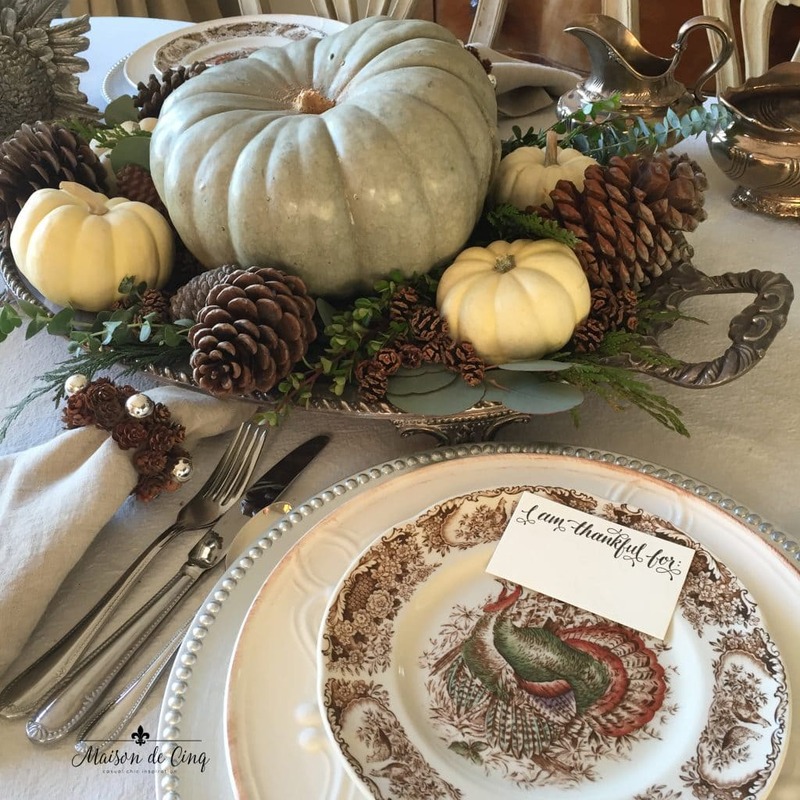 And I love the mix of the green pumpkins with the pinecones! I purchased these turkey plates after looking at them on Ebay for months! 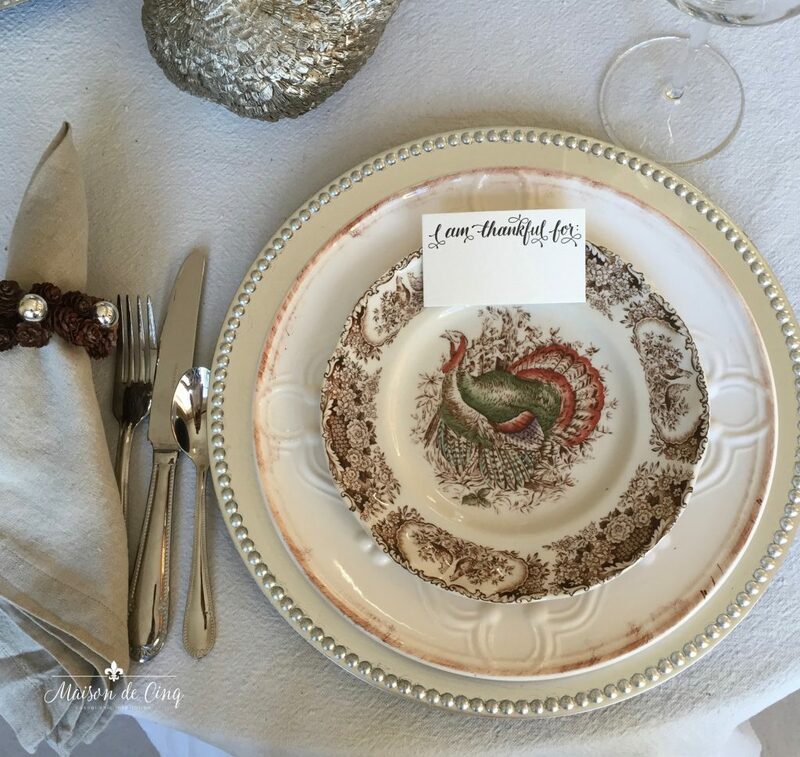 I love the colors in the turkey, and the brown transferware on the trim. They were my very first themed plate purchase when I first started collecting different holiday plates and they are still one of my favorites! 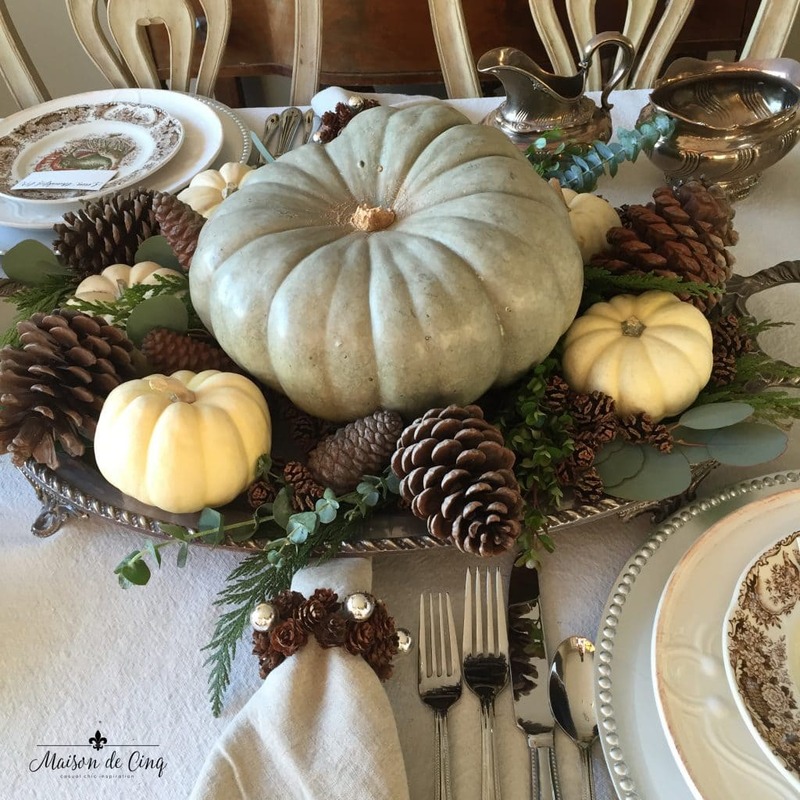 For the centerpiece, I wanted to concentrate on greens and browns, so I used one large green pumpkin and piled around some smaller white ones. Then I also added some pinecones and live eucalyptus for color. Using greens in the centerpiece really brings out the green in the plates. 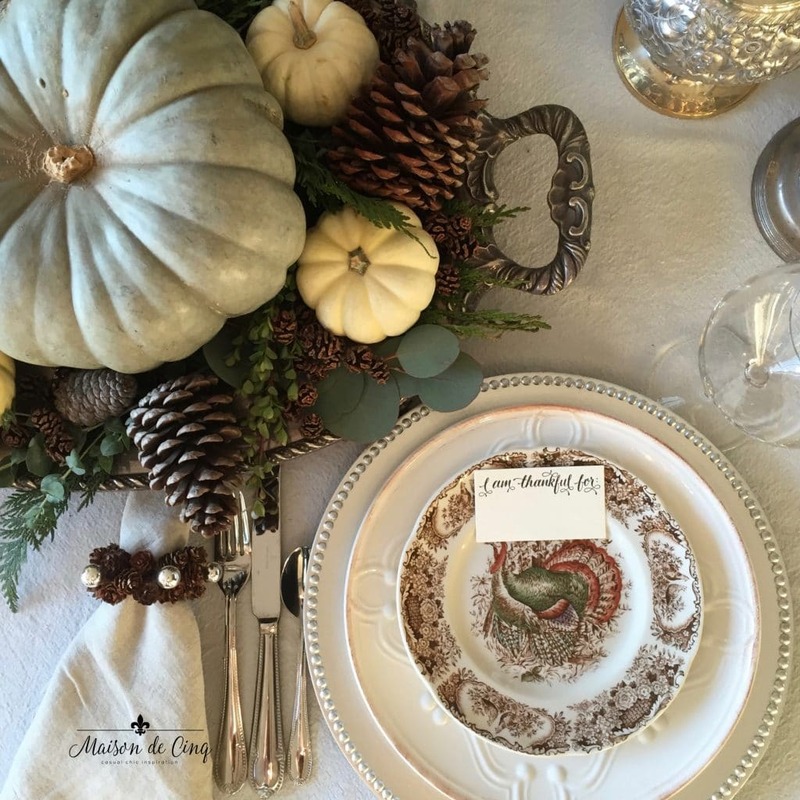 But my favorite thing on the table are these little “Thankful” place cards! I bought them at Paper Source last year and I loved them so much, I had to get them again! We will all write down what we are most thankful for this year, and then take turns reading them out loud at dinner. It’s just a really nice way of pausing and saying thanks for all that we have. 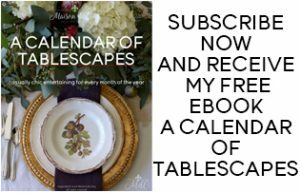 And for lots more tablescape ideas, as well as my tips and tricks, be sure to sign up for my emails and get my free e-book, A Calendar of Tablescapes! Very pretty! The centerpiece goes nicely with your plates. Thanks so much Shelley! 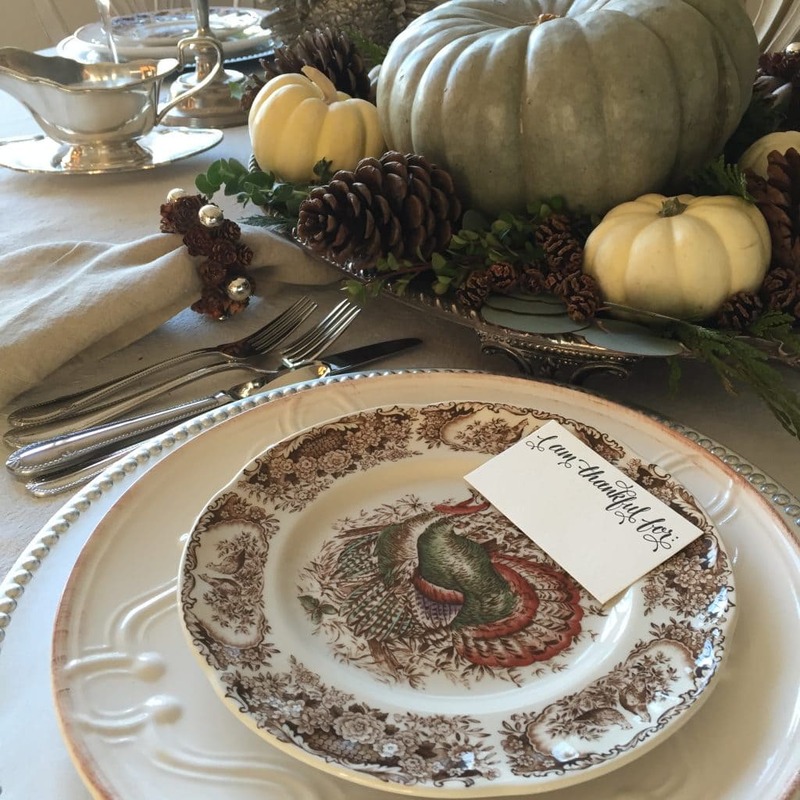 I fell in love with these plates a few years ago when I first discovered "tablescaping" due to Delores of Vignette Design. I had never owned a "themed" plate before that and somehow, all her plates just spoke to me. So I bought these as a treat. However, I only bought 8 and I'm having 10 for dinner! Sigh… and now they are $60 or $70 a plate on Ebay – such a bummer. 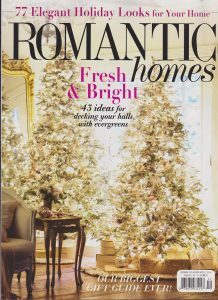 I thought I would just purchase two more but I guess my husband and I will have to just use something coordinating! Gorgeous! I love the silver tray and those Turkey plates. Johnson Brothers makes great holiday plates, which reminds me I could use a few more of their Christmas ones. I have been checking Homegoods but I need to look on Ebay. 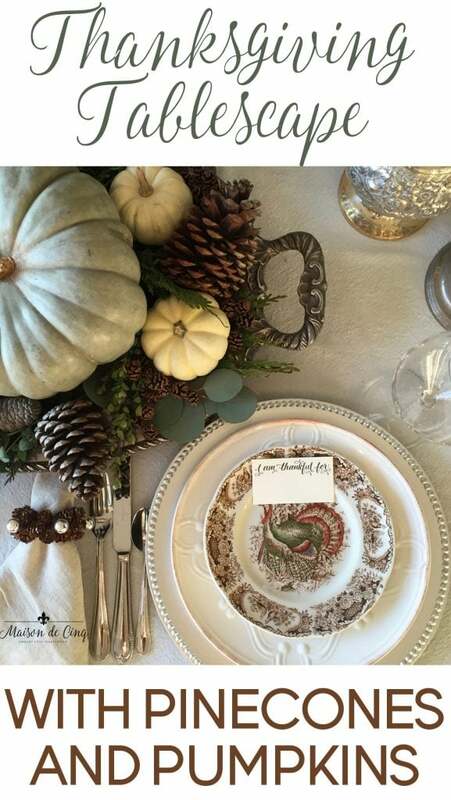 Your whole table looks so inviting and ready for Thanksgiving!